AMC has a major event in mind. Deadline reports the network is planning a crossover between The Walking Dead and Fear the Walking Dead. The eighth season of The Walking Dead kicks off with its 100th episode on AMC on October 22nd at 9 p.m. ET/PT. Meanwhile, season three of Fear the Walking Dead wraps on October 15th. What do you think? Do you watch The Walking Dead and/or Fear the Walking Dead? Who do you think is the link between the two shows? 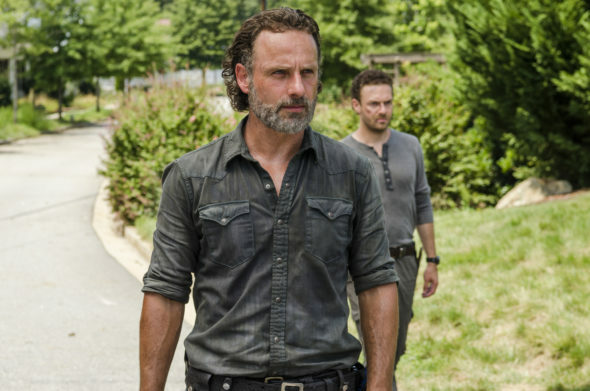 More about: AMC TV shows: canceled or renewed?, Fear the Walking Dead, Fear the Walking Dead: canceled or renewed?, The Walking Dead, The Walking Dead: canceled or renewed? This is ridiculous, as if they weren’t killing The Walking Dead enough, now they want to kill it altogether by infecting it with the dumb spin off?? Cancel Fear the walking dummies and get rid of crossover. Yes Fear’s ratings are the lowest they have ever been so according to Kirkman that means time to leech off the success of the main again to save it. Just finish them both soon. This is a MISTAKE. There is ZERO REASON to do this. What possible reason could there be? Couldn’t agree more, it’s like they are trying to drive viewers away from the main show completely.